In April 1919 British Indian troops fired on an unarmed crowd of protestors in Amritsar in the Punjab. Hundreds were killed. On 13 April 1919, British Indian troops fired on an unarmed crowd at Jallianwala Bagh in Amritsar in the Punjab. Hundreds were killed. The massacre caused an outcry in India and abroad, and would be a turning point for the growing Indian nationalist movement. Lucy Burns brings you eye-witness testimony from the time. 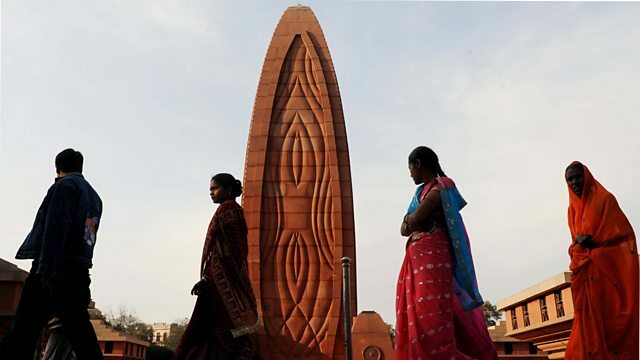 Photo: Indian visitors walk past the Flame of Liberty memorial at Jallianwala Bagh in Amritsar. Credit:Narinder Nanu/AFP/Getty Images.